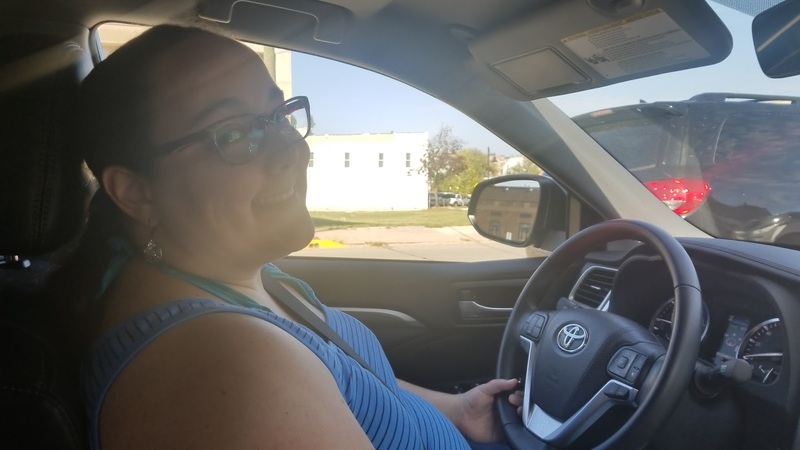 This past weekend, my boyfriend and I headed to the west side of the state (specifically, Portage and the Kalamazoo area) to visit a college friend of mine and her husband. I've known this friend since we were 18 years old—we met while being stand partners in the Michigan Pops Orchestra, at the University of Michigan. I was able to try out the 2017 Toyota Highlander Hybrid Limited for the week, including the duration of our trip to Portage, and was very spoiled—it's a fantastic car. The color of the car I received to try out is a dark red, and is called "Ooh La La Rouge." 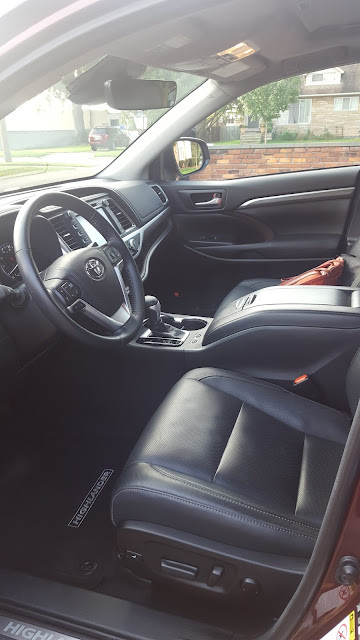 I had actually never driven an SUV before this past week, so I was a little nervous, but the Highlander Hybrid is very user-friendly. It was also a great car to drive this week, during a heat wave that we had (90 degree weather in September, in Michigan—crazy! ), because it had both great A/C and also an air-conditioned SEATS option (yes, I said seats!). 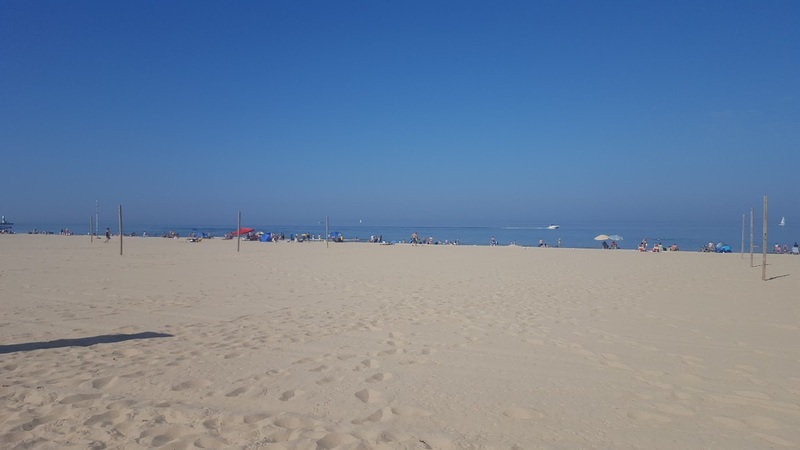 There was only the two of us for the duration of our trip, but on Saturday, all four of us headed over to the South Haven beach. The car can seat seven people, but with only four people, it was quite comfortable. The backseat passengers have their own cup holders, climate control, and USB charging area, as well. With the unexpectedly warm weather, it was a great day for the beach! 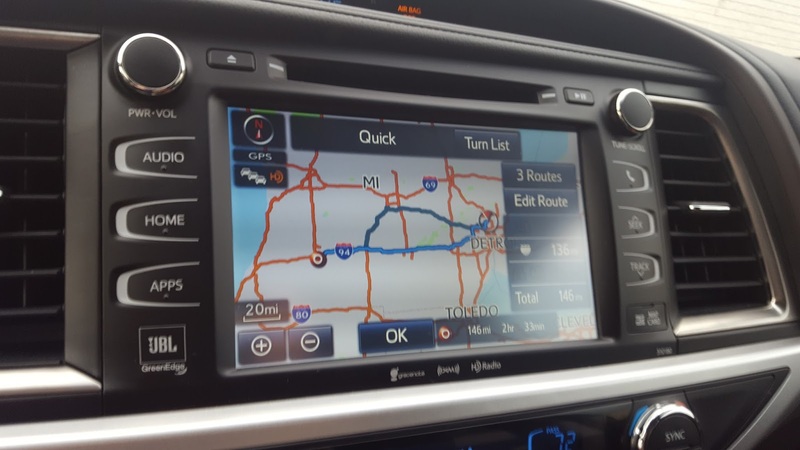 On my personal car, I usually use Google Maps to get me where I need to go, but the navigation on the Highlander Hybrid was great. To get to my friend's house, I put in her exact address, but to get to a few restaurants around town, we did a "Destination of Interest" type search. 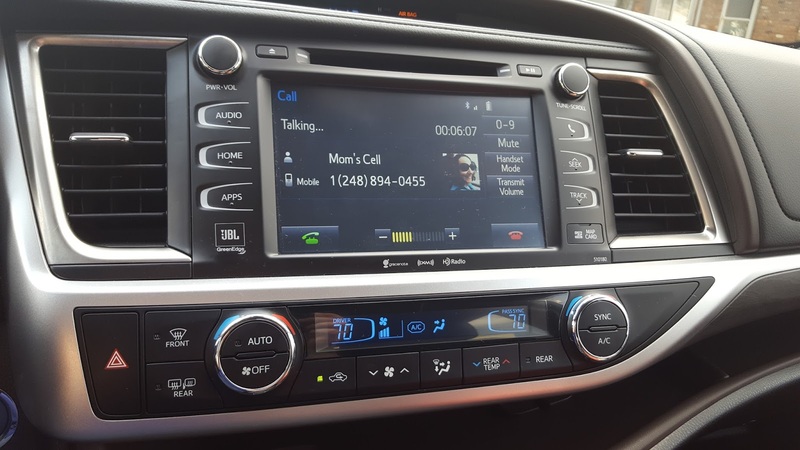 One of the first things I did when I started driving the car was to hook up my phone to the car's Bluetooth, for hands-free calls, and the system will also tell you when someone texts you, and read you the text if you're so inclined. It can even sync your emails, though it chose to sync to my work email account so I had to figure out how to unsync that, ha. My mom's picture came up when I called her! I got a kick out of that. After the beach on Saturday, we drove down to Saugatuck, one of my favorite cities on the west side of Michigan, and had a fantastic fried chicken dinner at The Southerner. I had wanted to try The Southerner when I was in Saugatuck this past July, but it had an hour and a half wait for dinner; this time, we were smarter, and we did call-ahead seating, so the wait was only about 20 minutes. You can see what road you're on and also what the speed limit is - convenient! The car has a push-start button (no keys required). This was new to me, as my "regular" car requires a key, but very convenient. All you had to do was push down on the brakes and hit the button, at the same time. The trunk. 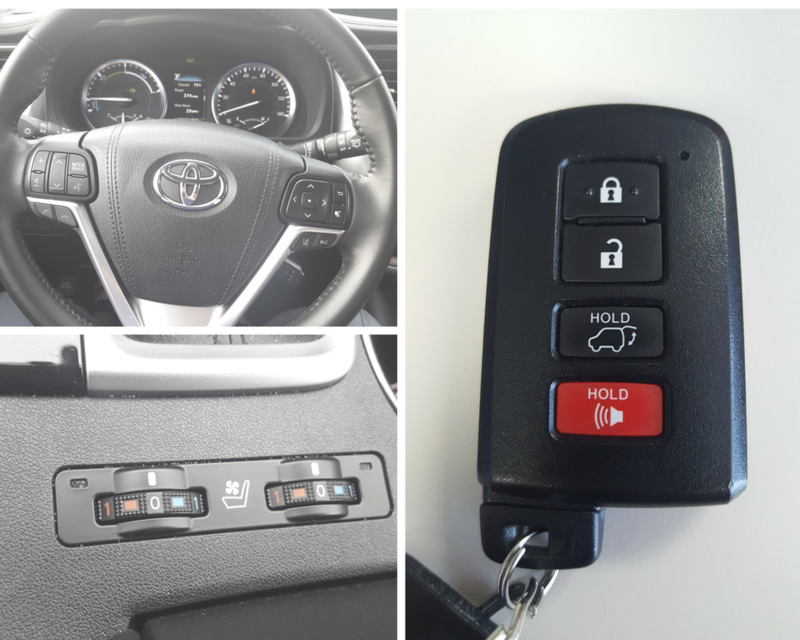 To open the trunk, you click the button on the key fob, and it will make a BEEP BEEP noise and then open. Perfect for when your hands are full of groceries (or kids, if you have a baby). It's SO QUIET. The first time I turned the car on, I wasn't actually sure if it was on or not ... no joke. The car will unlock once you approach it. I quickly figured out that whenever I walked near the car, it would unlock—this was because I had the key fob in my pocket. I felt like a wizard not having to hit the unlock button! 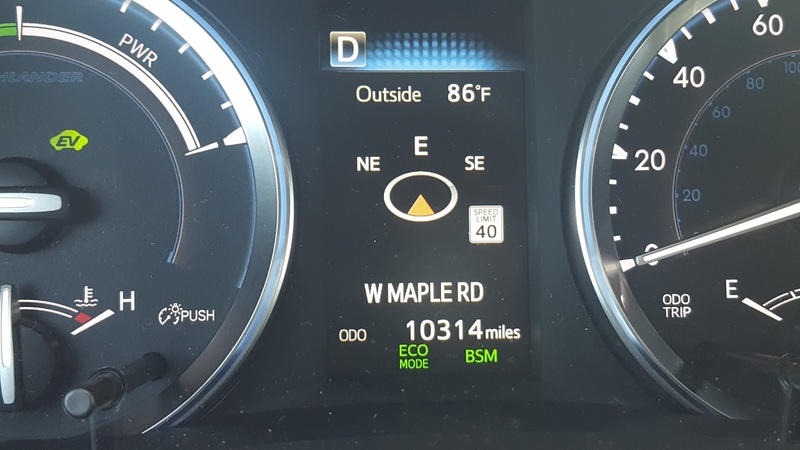 For an SUV, it gets GREAT mileage. The official fuel estimate for the Hybrid Limited is 28 mpg, which includes 29 mpg in the city, and 27 mpg highway. 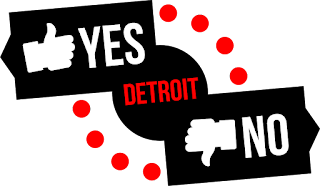 However, when we left Portage, I put about $15.00 worth of gas into the car, and that filled it up by a half-tank—which means it would only be about $30 to fill up the entire tank. You can pause, rewind, and fast-forward radio stations. 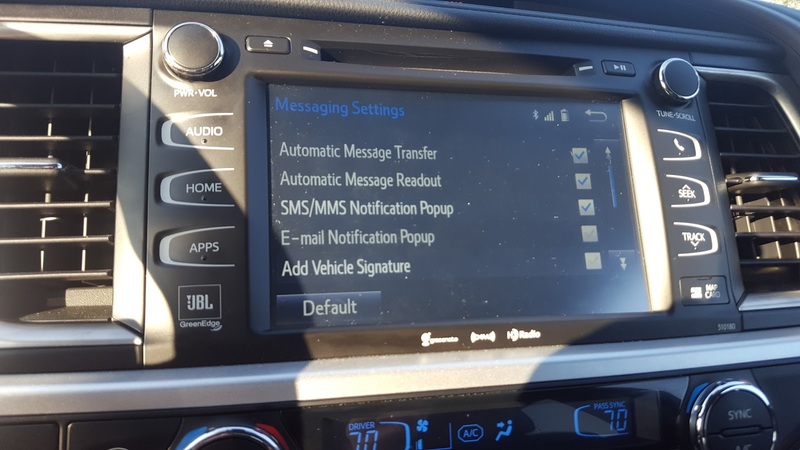 This is apparently a feature of the Sirius XM Radio, which was included in the car (you would normally pay a monthly fee, I'd imagine). I inadvertently found this out when I made a phone call, and then the radio station I was listening to was still on the same song ... very cool feature! It will help protect you from accidents. When you are driving, if there's a car in your blind spot, an orange light on your side mirrors will appear. Also, if you are in reverse and a car is behind you, the car will beep—when I was leaving work one day, it beeped, and I then noticed the car that was passing behind me. It has a ton of apps, including Yelp and Pandora! And the touchscreen is pretty nice also. You have to open the apps on your phone to get them to work on the car touchscreen, but this was still a neat feature. The touchscreen itself was very nice, also, and easy to use. You can fold the 3rd row of seats up or down. 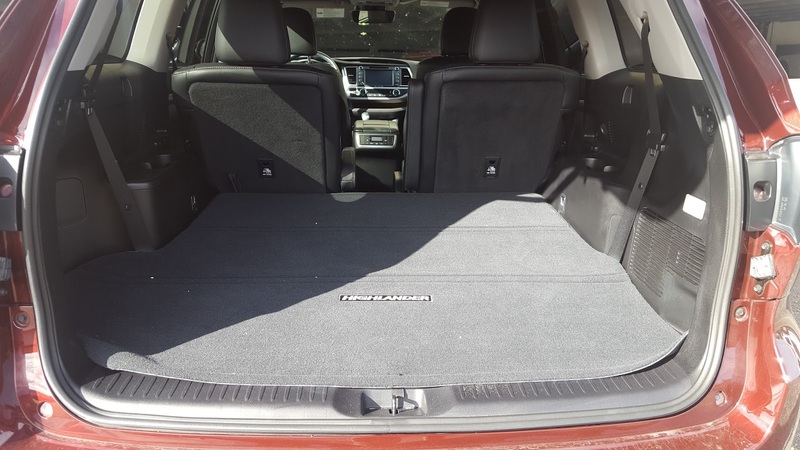 Depending on if you have more passengers or more cargo, there are extra seats you can fold up or down. We kept them down during the trip because we used the extra luggage room instead. It's a fun car to drive. 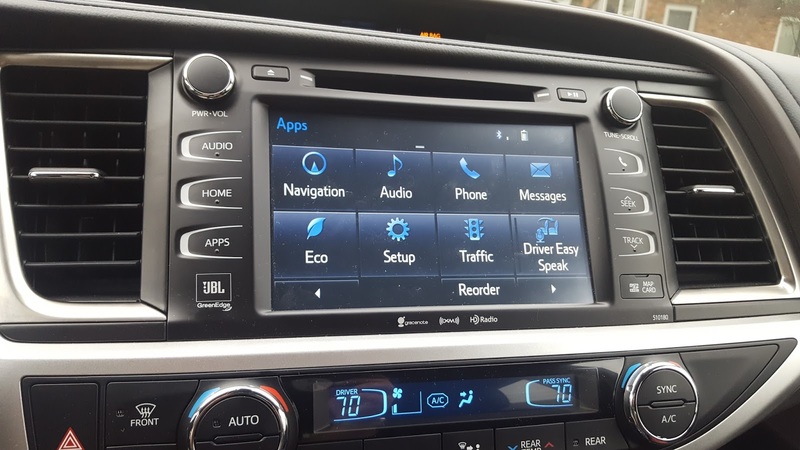 I'm definitely a techie, so I had fun playing with the touchscreen and all of the features of the car (which my "regular" car does not have!). I definitely miss those features now that my time with the car has come to an end. 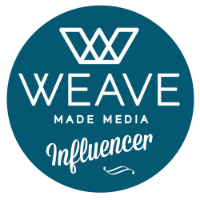 I'll be honest and say that when I went back to my regular car, to drive to work this morning, it feels almost like driving a go-kart, after driving the Highlander Hybrid Limited, ha ... 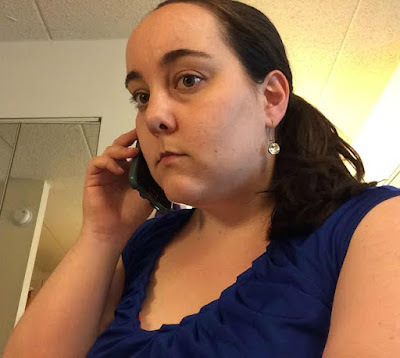 I drive a sedan, and I'm definitely missing driving an SUV now. 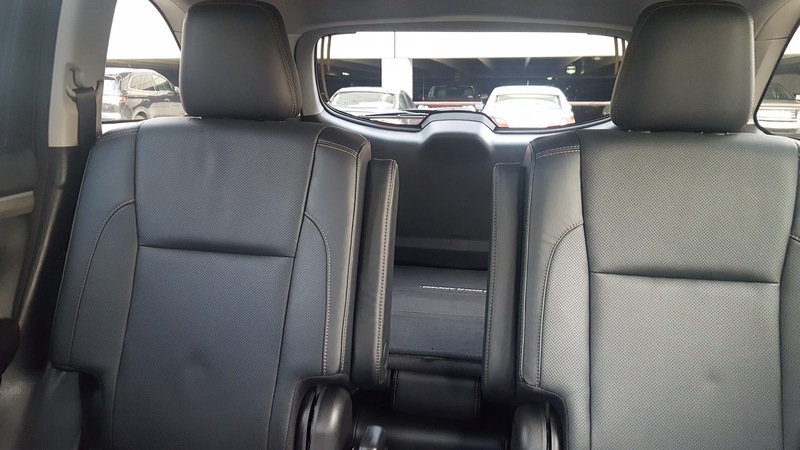 This car is perfect for a road trip or everyday life, too, because of the massive amount of space in the cargo area (and if you have more people than you do cargo, you can fold up the seats to fit extra people in the car, as it can fit seven people in total). 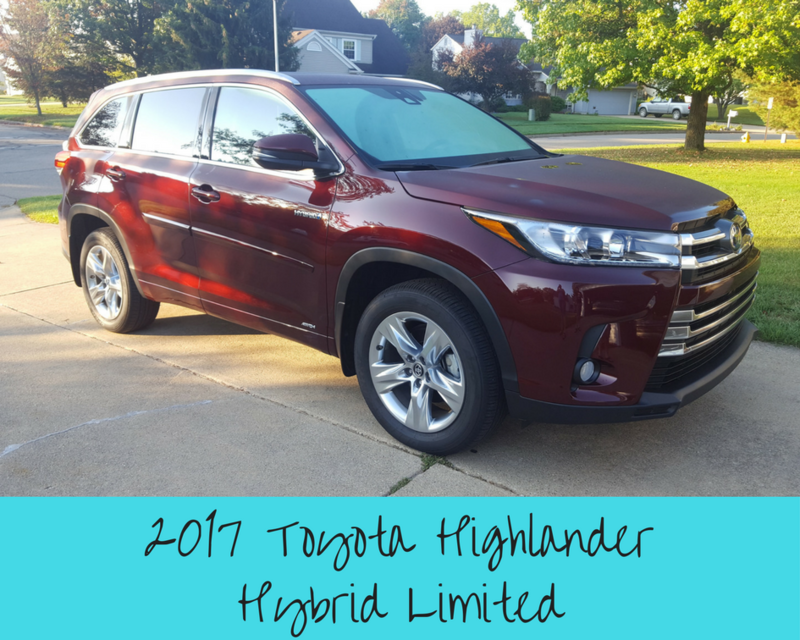 Overall, I definitely enjoyed my Highlander Hybrid Limited experience, and I'd recommend the car to anyone who is looking for a little more luxury in their life.